By now, hopefully you readers know that I love to cook (Just wait until we get closer to the holidays and I start posting recipes!). Admittedly, I’m super picky about what I use to cook. Plain and simple, not just any utensil will do. 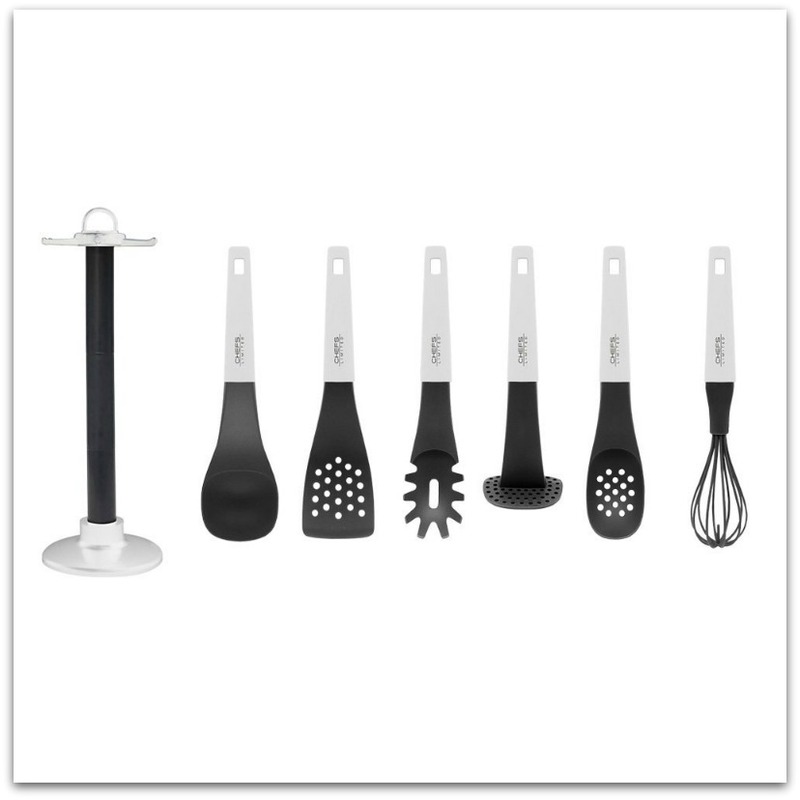 So, I honestly didn’t expect too much from Chefs Limited Modern Six Piece Kitchen Utensil Set with its $34.99 price tag. Ahhh … happily surprised was this little “chef”. To start, the set comes with a carousel-holder that is very convenient and the design is both functional and mad cool. It’s sleek! 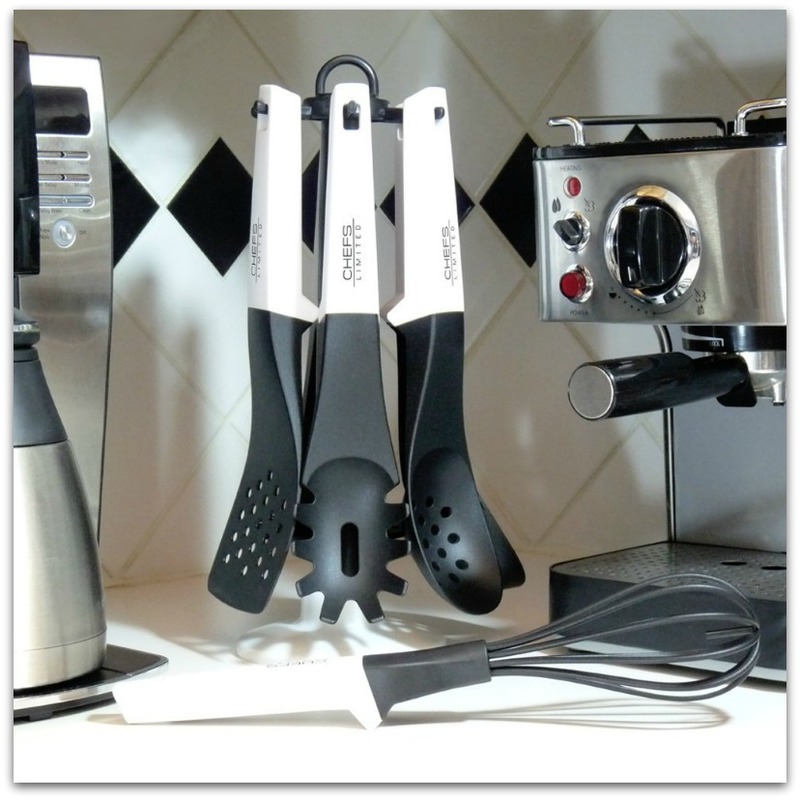 The utensils themselves are sturdy and designed with comfort in mind. The Chefs Limited Modern Six Piece Kitchen Utensil Set includes: A Spaghetti Server, Slotted Spoon, Soup Ladle, Flipper Spatula, Potato Masher and Whisk. These are all the items that a “newbie” needs, but are so well made that even a seasoned chef will appreciate them. Put this one on you holiday shopping list! A great design is well … great. But, we need more than that right? Yes. We do. This set is heat resistant up to 410 degrees, built with FDA approved nylon, and they are dishwasher safe! Yea! Oops. I almost forgot to mention another aspect of the design – each utensil is ergonomic with a floating head so that when placed on the counter, the head of the utensil does not touch. If you’d like your own set of Chefs Limited Modern Six Piece Kitchen Utensil Set you can stop by Amazon and if you’re worried about not liking them (despite my review) Chefs Limited offers a 100% Money Back Guarantee!